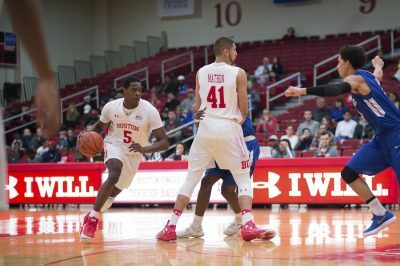 The Boston University men’s basketball team is destined to look much different next year with the departure of its five seniors. Usually, this would raise questions as to where leadership would come from and who would be poised to assume a head role on the team. However, freshman guard Walter Whyte may already be solving that issue for the Terriers (14-15, 10-8 Patriot League). Whyte, the Terriers’ most anticipated recruit for the class of 2017, has emerged as a commanding presence in the locker room and on the court as the regular season progressed. Heading into Thursday’s Patriot League quarterfinal matchup, Whyte is averaging 13.2 points over his last five games after notching double digits just three times in the nine contests that preceded this stretch. Rebound-wise, the New Haven, Connecticut native has become a force as well. After averaging just 3.7 boards per game entering Patriot League competition, Whyte has upped that number to 4.9 per tilt. He put up 16 points and 11 rebound in a 92-81 win over Lehigh University on Jan. 8, 14 points and 10 rebounds in a loss to Bucknell University on Jan. 28 and 15 points and seven boards in a victory over Loyola University Maryland on Jan. 31. Most recently, after missing four games to injury, all of which were Terrier losses, Whyte has reinvigorated BU, leading them to two consecutive wins and the No. 5 seed in the conference tournament. He netted 14 points on 6-for-11 shooting against Lafayette College on Feb. 21 before helping the Terriers to a comeback win over the United States Military Academy Saturday afternoon with 10 points. The St. Luke’s School product was a decorated high school player, earning NEPSAC Player of the Year twice while wearing the badge of being the only mid-major baller to perform in the 16th annual Jordan Brand Classic. However, it took Whyte a little while to transition to playing college ball. After using his 6-foot-6 frame to play in the front court in high school, Whyte had to make the switch to handling the rock and shooting threes from the perimeter. The learning curve Whyte faced was evident in the first few weeks of the season. After averaging 9.0 points through BU’s first four games, Whyte saw his minutes and production decrease over the following three contests. While his scant 17 minutes against Wheaton College can simply be chalked up to the Terriers facing Division III competition, Whyte saw just 12 minutes against the University of New Hampshire the following outing. He then hit just one of his five field goal attempts at the then-No. 10 University of Miami, decreasing his points per game average to seven. This slide led Jones to lend Whyte a seat on the bench for the subsequent outings against Elon University and Harvard University, a multi-game stint that got the wheels in motion for Whyte’s emergence in conference play. The move motivated Whyte, as he returned with a vengeance after the Christmas holiday. In the Terriers’ Patriot League opener against Army (13-17, 6-12 Patriot League), Whyte notched 16 points and six rebounds, helping his team to an eight-point win. Two games later, Whyte was at it again at the glass, hauling in seven rebounds to accompany eight points in a 68-65 loss to Loyola (9-21, 6-12 Patriot League). During the contest, BU was out-rebounded by the Greyhounds 43-36. Whyte noted the importance of this facet of the game in his team’s success. With this added confidence came a more dangerous three-point shot. As Whyte became more comfortable playing in the backcourt, his shooting followed suit. He knocked down two of the trio of threes he attempted in the triumph over Army before going 3-for-3 in a three-game span from Jan. 8 to Jan. 14. However, what has impressed Whyte’s BU counterparts more than his maturation on the court has been his development off the court. Whyte has not been bashful in the locker room, fitting in nicely with the senior-laden group with a strong sense of humor. Living with his freshmen counterparts has allowed Whyte to create bonds that will last throughout his college tenure, and his personality has made its mark on the rest of the team. With the Terriers slated to have just one senior next season, guard Kamali Chambers, the door will be ajar for Whyte to step into a pilot role on the squad. Leading on the court and in the classroom with a sense of humor intact is a role one can expect to see Whyte fulfill as his college career progresses. It sounds like BU has picked a great match for the team. I look forward to Walter’s growth and the cohesion he will bring to the team. Walter is awesome on and off the court!